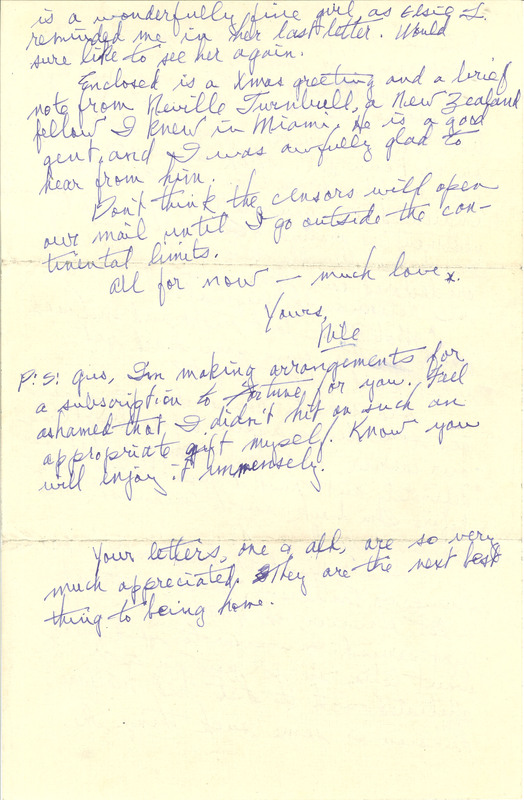 is a wonderful fine girl, as Elsie L. reminded me in her last letter. Would sure like to see her again. Enclosed is a Xmas greeting and a brief note from Neville Turnbull, a New Zealand fellow I knew in Miami. He is a good gent, and I was awfully glad to hear from him. Don't think the censors will open our mail until I go outside the continental limits. All for now - much love. Yours, Nile P:S: Gus, I'm making arrangements for a subscription to Fortune for you. Feel ashamed that I didn't hit on such an appropriate gift myself. Know you will enjoy it immensely. Your letters, one & all, are so very much appreciated. They are the next best thing to being home.